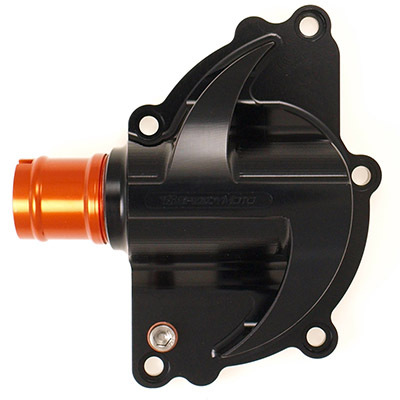 EVO Waterpump Housing – Black. 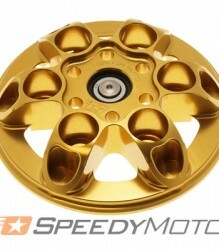 Fits all 2002-Current Superbikes, 2002-Current S4R Monsters, ST2, ST3, ST4. EVOlution means a change or a mutation to adapt to or become better suited to its environment. 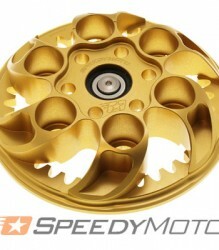 Evolution was the idea behind the SpeedyMoto Waterpump re-design. The change to the water pump housing continues an evolution in Ducati temperature management and crash protection. All with a lower price too! EVO is a Lighter, Stronger, Better Flowing Water Pump Housing fitting the latest Ducatis. Has proven to increase the flow and efficiency of your cooling system. Fits perfectly—won’t wear holes in your bodywork. 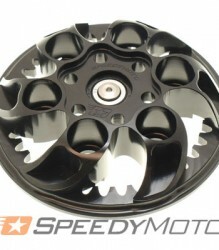 By helping protect your investment from tip-over mishaps and racetrack inevitability, SpeedyMoto water pump housing sets your mind at ease and lets you concentrate on the ride. 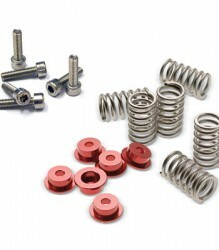 [Note] Will not fit older models with 4-bolt patterns.